The State Bank of India expects personal loan borrowers to pay the loan amount in equated monthly installments, this is known as the loan EMI. Use online personal loan calculator to know the emi, tenure and net payable amount of loan. SBI Personal Loan calculator available on our website which is use to calculate the EMI Payable for the entire tenure when you take a loan from SBI Bank. Both the formulas should give the same result, and this is the amount that the borrower will have to pay every month until the loan is repaid in full. Interest Rate – Though the Reserve Bank of India lays down the rules and regulations, SBI will charge an interest rate based on your repayment capacity, risks associated with giving you a loan, job history, income, your CIBIL score. The interest rate is directly proportional to the EMI, hence, higher the interest rate, higher the EMI. You can use the SBI Personal Loan EMI calculator to check the monthly EMI according to loan amount, interest rate and tenure. Loan Tenure – Though most personal loans are available for a tenor of 1-5 years, the amount can vary across financial institutions. The loan tenor is indirectly proportional to the EMI, hence, longer the loan tenor, the lower the EMI. CIBIL score – The Credit Information Bureau (India) Limited gives a score to every individual citizen of the country. The score is based on loan history and considers your payments, late payments, and other factors. The score is given out of 900. A credit score is indirectly proportional to EMI, hence, the higher the credit score, the lower is the interest rate charged, and the lower is the EMI. Level of Income – Banks are willing to negotiate a lower interest rate for people with higher earnings. Thus, the income you earn is indirectly proportional to the EMI, hence, the higher the income, the lower the rate of interest and the lower is the EMI. It is free – An online EMI calculator is free to use. You can access online calculators from anywhere – An online EMI calculator can be easily accessed on any device from laptops to smartphones and tablets. Calculate by changing parameters –. Change loan amount or monthly installments (you just must fill the number of years and the calculator will do the rest) to know the amount you are comfortable paying every month. 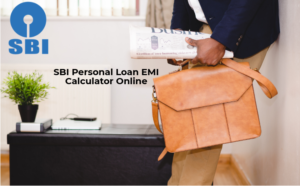 The SBI personal loan EMI calculator is an easy-to-use tool, which can simplify the calculations. Like all other calculations, this requires you to fill in details such as principal amount, tenor and interest rate. 1. Why should I calculate the EMI online? There are many benefits of calculating personal loan EMI which are shared above, but the biggest advantage is being able to calculate your EMI before approaching the bank and using various combinations to arrive at a figure you are most comfortable paying. 2. Does the online calculator give exact EMI? The Loan EMI Calculator gives an approximation, and you should approach a Customer Executive to help you calculate the exact EMI payable. 3. What is the CIBIL Score? The score is given to an individual out of 900 points. It determines the statistical loan paying capacity of an individual. A CIBIL score of 750+ is considered as good. The loan amount approved by the bank for the borrowers to meet their expenditures is known as the principal amount. The interest that SBI will charge on the loan amount is known as the interest rate. The number of years within which a borrower is expected to repay the principal and interest amount in full to the bank is known as the tenor. This is the equated monthly installment, which a borrower has to pay every month after availing the loan, and until the loan amount with interest is repaid in full. The fee charged by the SBI for processing the personal loan amount is known as the processing fees. A State Bank EMI calculator will not take the fee into account while calculating the EMI. Income & Salary – You need a minimum salary of 5,000 with a minimum work experience of 2 years. Taking a personal loan can be unavoidable, but knowing you have the capacity to repay the loan without a hassle is also important. Hence, you should use the SBI personal loan calculator to know the amount that will be liable to pay every month if the loan is approved.